What I’m trying to ask is how comfortable are you with numbers? As children, we learn to count, 1, 2, 3… Then we begin to realize a one to one correspondence, that one isn’t just a number, it is a value, a penny or one fork, or one person. The bigger the number, the more items. We learn some rules for numbers: That one plus anything makes one more. That if we take away one, it makes the number smaller. Next thing you know we are adding and taking away all kinds of numbers. Then along comes place value and we learn to carry numbers; there are ones, tens, hundreds, thousands, ten thousands, whew! And for many children, each number becomes a solid thing, no longer fluent, no longer one plus one plus one makes three. Three is, well, three. It means a certain amount, and we no longer see it as individual items making up a whole. I would like you to try an experiment. Without counting, take a look at image 1. How many did you see this time? 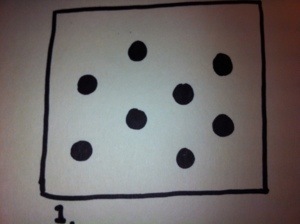 Now think about how you saw the dots in each image. How did you group them or add them? Which picture was easier for you? 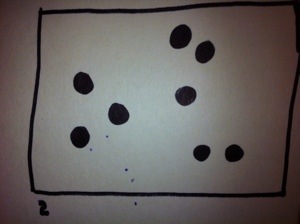 The neatly grouped dots or the randomly spaced ones? Show the pictures to someone else. They will probably come up with the same number you did. Ask them to describe how they saw the dots, grouped them, made sense of them. Was their method different? Did you like it better than your method? Will you see the dots differently the next time you look? Whether you realize it or not, you have just made some new connections about the number eight. Did your new sense of the number 8 make the problem less complicated? Or did you pull out some algebra skills? We rarely see dot cards used outside of first, second, or third grade here in the US. I think we may be losing valuable math fluency by not continuing to expose our children to these practices on a regular basis throughout their education. It is especially relevant now, as teachers are asking students to think about the different elements of math problems, asking them to make connections from one set of circumstances to another, expecting them to be able to break apart and re-form numbers like a set of Lego blocks. Yet, from my own observations, we have 7-12 grade students who lack a basic ability to do this. Cards with configurations of objects, that we often call “dot” card number talks, establish important new principles for mathematics classes. While it may seem that these arrangements of shapes are only for young children, we have found that they are critical for older children – even high school students – because they help to lay the groundwork for changing how students think about mathematics. Dot cards do not suggest procedures that students are “supposed” to follow; instead, they encourage students to think about what they “see” rather than what they are supposed to “do.” This frees up students for learning new ways of interacting in math class. • Just as people “see” things differently, there are often many ways to approach any mathematical problem. • Explaining one’s thinking clearly is important. This requires that students to retrace the steps of their answers and learn to use academic language, where possible, to describe what they did to solve the problem. • It is important for students not only to explain what they did, but why their process makes sense. In the case of dot card number talks, this involves where they “saw” the numbers they used. In the case of arithmetic operations, it involves understanding the mathematics that underlies any procedure that they use. Introduce a new fluidity into your classroom. Check out more about dot cards in this piece by Math Coach’s Corner. If you have good number sense activities resources, I’d be happy to link to them here!